Stir it up! Little darlin', stir it up! Saute the onion in 1-2 tbsp. of olive oil over medium heat in a medium-large pot until translucent. Add the squash, curry powder, salt and pepper and continue to saute for 5 minutes. Stir continually to ensure that the spices don't burn. Add enough water to cover the mix by about 1/2". Cover and bring to a boil. Drop the heat down and simmer for about 30 minutes, or until the squash is tender. Turn the heat off and let the soup cool slightly. Using a blender or food processor, puree small batches of the soup (I put the pureed soup into a new pot and keep it warm over low heat). Even better, use a stick blender if you have one. If you like creamy pureed soups, I highly recommend getting one! My awesome uncle David got me one about 8 years ago and I use it all of the time! 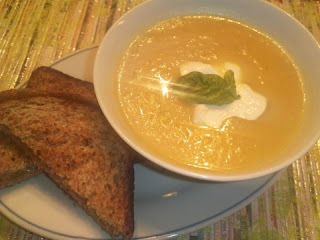 Once the soup is pureed, ladle it out into bowls and top with a dollop of sour cream. Warm, Comforting and Super Easy! Combine all of the ingredients into a large roasting pan, and stir until well coated. Co ok at 350 for 40 minutes or until tender. Tah Dah! I also like to add fresh Italian Parsley and Oregano. You can add in all kinds of other veggies too! 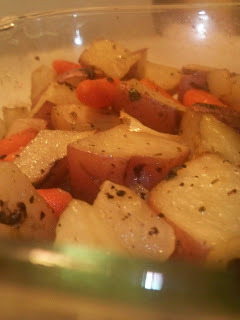 This recipe is also great with beets, squash, parsnips, turnips or bell peppers! 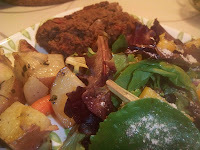 This side goes great with Lentil Loaf. Making bread sounds hard, but I promise, it's really not. 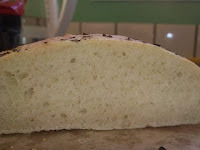 3 1/2 c. Unbleached All Purpose Flour, Plus more for handling and preparing the dough. In a large bowl (if using your big strong arm) or the bowl for your stand mixer (if you're using your mixer with a dough attachment) dissolve the honey/sugar in the hot water. Once dissolved, add the cool water (you should now have lukewarm water). Stir in the yeast and let sit for 7 minutes. Gradually add the olive oil, flour and salt. Don't worry if the dough is sticky-ish. 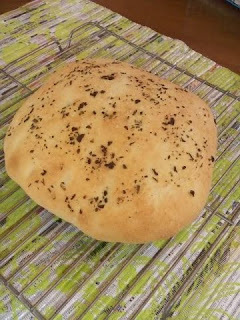 It doesn't need to be kneaded. Cover the bowl with a damp cloth or with a non-airtight lid. Let the dough rise until it falls and becomes flat on top (about 2 hours in a warm house, but more like 3 or 4 hours in a cold house like mine.). You can use the dough right away after it rises and falls, but it is really sticky and is hard to handle. Your best bet is to refrigerate it for at least 2 hours (up to 14 days) before using. Once you're ready to bake the bread, remove the dough from the refrigerator and divide it into 3 pieces. My pizza stone can only hold 2 loaves at a time, so I bake 2 loaves together and one all by its lonesome. Keep the dough that you're not using refrigerated until it's ready for its turn to rise and shine. For the dough that is ready to go : Dust your hands and 1 portion of the dough with flour. Shape it into a ball by stretching the surface of the dough around the bottom about 6 times, turning the dough as you go. Shape the ball into a rectangle and flatten to about 3/4" thick. Leave the dough to rest on the cutting board (Make sure the cutting board is well floured, or else the dough will stick). After 20 minutes, drizzle olive oil on the top of the dough. Use your fingers to spread the oil to coat the top of the dough, then sprinkle on your seasonings and let rest for 20 more minutes. After oiling and herbing your dough, set the oven to 425 and put your pizza stone or cookie sheet in to heat. After 20 minutes, pour the boiling water into a baking pan on the rack below the rack your bread will bake on. Sprinkle cornmeal on the pizza stone/cookie sheet and slide the dough onto it. Bake until golden brown (about 25 minutes). Remove and let cool completely before eating. Pat yourself on the back! Heat 1 Tbsp. of olive oil over medium heat in a large frying pan. Add the garlic, mushrooms, salt and pepper. Don't worry if it looks like there are enough mushrooms for 10 people; I promise you that they will cook down a ton. Saute the mushrooms until they have cooked down and are heated throughout. 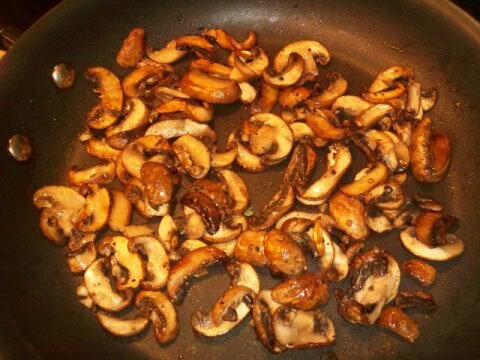 While the mushrooms are cooking, slice the focaccia in half (horizontally) and brush the inside of each half with olive oil. Broil in the oven until golden brown. 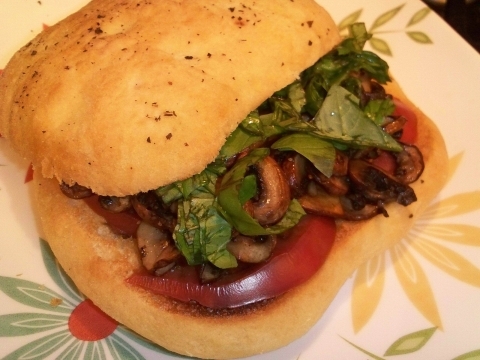 To assemble the sandwich, drizzle each half of the focaccia with balsamic vinegar, then layer on the filling. My favorite order is focaccia, cheese, tomato, mushrooms, basil, foccacia. I often leave the cheese out, but it is a nice addition. If you don't like a soggy sandwich, you can leave the balsamic off of the sandwich and serve it on the side as a dipping sauce. This sandwich is also great with roasted red pepper and fresh spinach. Another good variation is to use goat cheese instead of mozzarella. Preheat the oven to 400. In a medium bowl, soak the flax in 6 Tbsp. of water for at least 2 minutes. Add the vanilla and whisk until small bubbles are present. Add the flour, sugar, salt and remaining water and whisk together. The batter should be fairly thin. If needed, add a little more water. Grease and flour a cookie sheet. Using a tablespoon of batter for each cookie, drop 3 circles of batter on the cookie sheet. Seriously, don't get brave and try to do more than 3 cookies at once. The cookies have to be really hot to form correctly. If they are too cool, they crack. Also, you need time to let your little fingies cool off! Roll the cookie sheet around to spread the batter out until each cookie is about 3 1/2" in diameter. Bake at 400 degrees until the edge of the cookies are browned. Remove a cookie from the pan with a spatula. Fold the cookie in half so that the bottom side halves of the cookie are folded in towards each other (now you've got a half circle). Place a paper strip inside. Place the middle of the folded edge (open side up) perpendicularly on the rim of the mug and draw the corners of the cookie down (one into the mug and one outside). Now you've got a fortune cookie! If this is too big of a pain, just fold the cookie in half, and then in half again (bringing the 2 corners together). Repeat with the 2 remaining cookies, then start another batch. May all your cookies be fortunate!